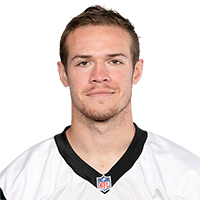 Published: Dec. 23, 2018 at 01:24 p.m.
Carolina Panthers quarterback Taylor Heinicke throws his first NFL career touchdown pass to Carolina Panthers tight end Ian Thomas. Published: Aug. 30, 2018 at 08:26 p.m.
Carolina Panthers quarterback Taylor Heinicke with solid behind the receiver pass to wide receiver Mose Frazier for 6-yard touchdown. Published: Aug. 25, 2018 at 12:35 a.m.
Carolina Panthers quarterback Taylor Heinicke pulls a Cam Newton by diving in for a touchdown against the New England Patriots.